We have had native French speakers in our mission full time since March 2015. They have taught many and after 5 months, we have the first fruits of that effort – a baptism! “We found Israel by knocking on an apartment door, originally looking for someone else, but obviously God was really looking for him. A couple months earlier, he lived in Congo and had been meeting with missionaries in Africa. He even had a baptismal date! Three days before that baptismal date, he was told he would be going to America. He had to leave his family, and everything he really knew, behind and come to America on his own. He told us that he thought he would never see or hear of the church again, until we knocked on his door. He also said, “It doesn’t matter if I’m in Africa, America, or the bottom of the sea, God was going to find me.” Since we met him, we taught him regularly, but he was hesitant to progress until we invited him to offer his first kneeling prayer. He said that was the moment everything changed for him, because he knew for himself what he didn’t understand before in Africa. Now he is a baptized member of the church, because he knows that it’s true! Such a wonderful experience to meet him and teach him 🙂 I know that wherever we are, is where we’re meant to be. And God is aware of the smallest and most specific details. On Monday, August 17, the Arizona Scottsdale Mission welcomed 23 new missionaries. The flights from SLC and Mexico City arrived around noon filled with excited but nervous missionaries. It takes all of our spare vehicles to get enough room to get this group from the airport to the Mesa Temple Visitors’ Center and back to the mission office. On this effort we had the 12 seater big van (nicknamed by the Assistants the “Arctic Cat”), a 7 seater mini van, Pres. Sweeney’s 7 seater Toyota Highlander and the crew cab mission truck with trailer! Typical for this time of year, the arriving missionaries were greeted by temperatures that topped out at 108. But, missionaries – if they have water – can do a lot of great things in hot weather. First stop – Mesa’s Pioneer Park where we had lunch of sub sandwiches, chips and (what else) lots of water! Then off to the Mesa Temple Visitor’s Center for a tour where we taught the missionaries to always “begin with the end in mind” and see your investigators in temple white. The next stop was the mission office and orientation – followed by pairing up with experienced missionaries to go contacting in various spots around Scottsdale. After an hour they have over 30 referrals! This is a dedicated group! Dinner followed – fabulous Cafe Rio burritos or salads – with Texas sheet cake and ice cream for dessert. The first day ended with the newly arrived missionaries teaching each other about the things they learned from Day 1 followed by videos on driving safety and Missionary Work and the Atonement by Elder Holland. Day 2 was picture morning and after a 5:30 am workout with Pres. Sweeney, the Elders were ready to go for breakfast (McDonalds sausage burritos and egg mcmuffins), fruit, juices, and cereal) by 6:00 am. They were joined by the Sisters at 7:00 am who also enjoyed the breakfast buffet. Group and single pictures followed – and then off to a nearby chapel for a driver training video where they were expected to answer a quiz on how to drive safely. Everyone passed! At 9:45 am, the Trainer and New Missionary meeting began – and by 11:15 am – everyone had their first companion and was settling in and ready for lunch – which was hamburgers and hot dogs cooked by Elder and Sister Dale – our fabulous missionary couple that prepares our large meals. They are wonderful! This is tied for the 2nd largest group – ever – ranking a few behind the July 2013 arrival of 30 new missionaries and tied with the September 2013 group with 23. They are well prepared and ready to work! Zone Conferences are next week and we’ll check in with each of them to see how they’re doing! We love them already! The Mission bid farewell to 12 of its best Elders and Sisters with a farewell dinner and testimony meeting on Sunday, August 16th. This group of missionaries was chock full of mission “legends” – those who (for example) rebuilt the active membership in Ft. Apache in preparation to become a ward, pioneered in Tonto Basin and Young strengthening these 2 little branches, had a family baptism of 7, lived in an apartment with a pet dog (only for a short time! ), and made “service” contacting one of the best ways to find new people to teach! All of them grew into consecrated missionaries while they served! The day was a hot one, so (except for the group picture) the entire evening was spent inside the mission home (avoiding the 105 degree heat) – where the missionaries dined on cafe rio burritos and salads with fresh tomatoes and avacado. Dessert was cheesecake with fresh peaches or Texas sheet cake with pecans (some took both!). Each missionary responded to the invitation to tell their circumstances 30 days and then 5 years into the future. It’s fascinating to get inside the minds of these returning young man and women and listen to where they want to be.down the road a bit. Based on their responses, great things lie ahead – including some large families! “Because I’m finally starting to recognize the Spirit – right now at least, it’s a tiny voice in the back of my head. But the times I’ve listened to it, things have worked out. For a long time, I thought that was just me. But I guess it’s not. For example: we were trying to contact somebody – I don’t remember who anymore. But we knocked on his door, and nobody answered, and all the lights were out. When we turned to walk away, the house across the street was all lit up. There were people talking and you could hear it all the way across the street. The thought came to mind that we should go to that house. Then I thought “No, that’s crazy. We don’t know those people. They probably don’t even care.” But then as we were walking to the car, my eyes were still drawn to that house. I’m sorry to say that I still didn’t say anything to Sister Jackson. Luckily, we were meeting with another lady on that street. When we stopped again (I hadn’t realized that she lived there) I finally said something. Sister Jackson said we could definitely go visit that house after we visited this lady. 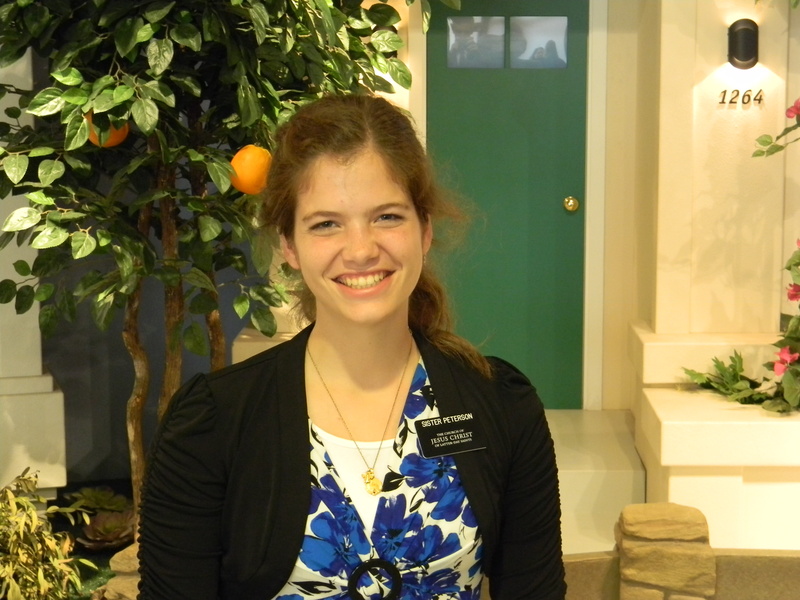 In February 2013, 4 months before the Arizona Scottsdale Mission was to receive its first missionaries, President and Sister Sweeney went on a recruiting trip – to Florida. Their first stop was to visit Ross and Jerrie Williams of Lake Wales. Ross had served for 5 years as a counselor to President Sweeney when he served as the stake president there. Jerrie had served as the stake Relief Society president. To say that the feelings were deep between the 2 couples would have been an understatement. The Sweeneys regarded the Williams as Saints in the finest sense of the word and they offered the Williams an invitation to join them and work side-by-side for 18 months in the mission office. Ross was a retired Florida Highway Patrol Trooper. He would be perfect for the mission fleet. Jerrie was a master at organizing and keeping the information flowing. She would be perfect for referrals. Without waiting for an answer, President Sweeney cleared their service with the missionary department so when their application arrived, they would be recommended for the ASM office. The application arrived in early April 2013 and they were called to serve just as proposed. It was a great fit! Elder Williams endeared himself to the missionaries. He did his Florida University “gator” cheer (hold your hand out arms straight and pretend the arms are the jaws of a gator while you clap your hands). He’d have them sing the U of F fight song: “We are the boys of old Florida. Down where the old gators play. We’ll stick together in all kinds of weather….for F L O R I D A (sound each letter).” They loved his hat, his swagger, his Elvis lines (“thank you, thank you very muuCH) – and they kept their cars and trucks mighty clean hoping to win the coveted “golden plates” license holder. Sister Williams accompanied him to zone conferences, interviews and on the late night calls for Elders and Sisters who were locked out of their cars or in accidents. She kept him focused and in good humor. Just before their release, Elder Williams had some undiagnosed pains. He hurt where it wasn’t supposed to hurt. Feeling concerned, they left for home a few weeks early and promptly got examined by the local VA hospital. After a few visits, the diagnosis was confirmed, and as Elder Williams often said “it ain’t good.” It was cancer – and there was no real way to know what the prognosis was. Ross had often mentioned that he wanted to live longer than his Dad. And, he did. But early this morning, Jerrie called to deliver the unwelcome news, her partner of 51 years in mortality, and forever to come, had passed. One of the privileges we have is to travel to stake conferences and encourage the Saints to live the gospel. Last weekend Elder Lawrence E. Corbridge of the Seventy along with Elder Michael L. Southward, Area Seventy, reorganized the Taylor Stake – one of the 14 stakes in the Arizona Scottsdale Mission. The Taylor stake is in the White Mountains and is just south of Snowflake and the Snowflake Temple. It is just like living in a small town in Utah. About 75% of the town is LDS. Elder Corbridge reminded us that the Lord could have just as easily called it “The Church of Jesus Christ” but he didn’t. He named it The Church of Jesus Christ of Latter-day Saints. Why the added words? Because, taught Elder Corbridge, it was important to the Savior that we, his friends, get “equal billing” to remind us that we are His friends and the reason the Church exists is to minister to us. It is further to invite us to labor with Him (who could do it all by himself – see 2 Nephi 27: 20-21) in the building of His Kingdom upon the earth. Lastly it is to remind us that we can become joint heirs with Him (Romans 8:17). 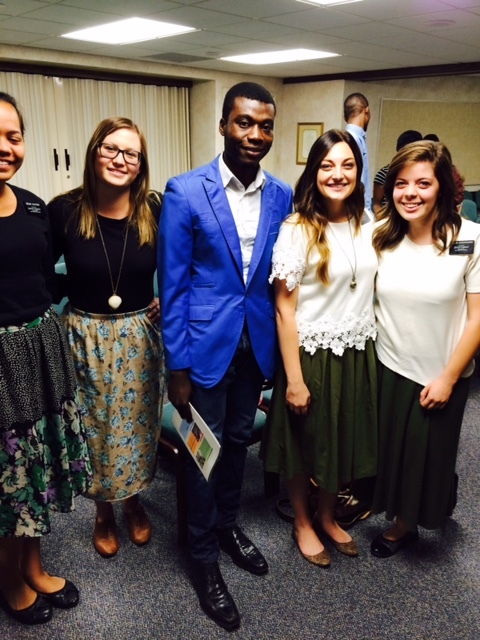 After the conference, Elder and Sister Corbridge joined several of the missionaries for a picture. All in His service! “We had two INCREDIBLE miracles with finding families!! The first came from Sister Oldham and I contacting less active members. We pulled up to the LA house and we prayed. When we finished the prayer we looked over to the left and saw a little park where a father and his son were playing soccer. Sister Oldham leaned over to me and said, ” We should go over there and you should talk soccer to him.” I was down to do it! So we got out and walked over to the park. As we were approaching the field you could tell that the father was getting a little uneasy by two Mormon missionaries walking over to him. He started getting their things to go, and we could see that they were about to leave, so I blurted out the question, “Whose your favorite team?” he looked at us a little puzzled and replied , “What?” I asked the question again and he looked at us and said, “The Tottenham Hotspurs…why?” I told him that I played soccer as well and was interested in who he supported. That really threw him off guard because usually when you have two Mormon missionaries approach you they’re going to ask to share a message with you and not your favorite soccer team. it was perfect! We were able to talk soccer a bit and I found out that he played for the Seattle Storm and then he played a little bit for the Seattle Sounders!! Crazy right! His name is John and he said that we can come back and play soccer with them again! So that’s the plan, soccer and Jesus…the celestial combination! The second miracle came from Sister Oldham and I making cookies and bringing them to less actives. We decided to go give some to the Gublers. They are a part member less active family. The husband is a member and has not been to church since he was twelve and his wife is not a member. Their kids have been blessed though which is awesome! When we stopped by and gave them the cookies they were really appreciative and let us come in and talk for a little bit. At the end of the visit they said that we could come back again!! Woohoo!! Yea for miracles! !